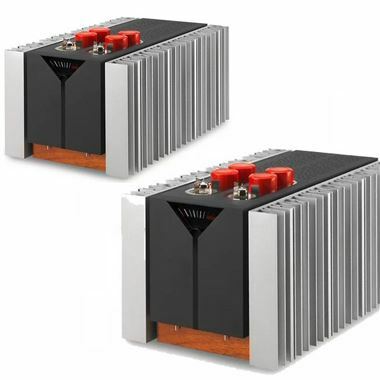 The Pathos Acoustics InPower monoblock power amplifiers represent the evolution of the INPOL® circuit, originally created with the birth of the T.T. integrated amplifier. The purpose of the InPower project was to design an amplifier able to drive all loudspeakers. even in spacious listening environments. All this with the same state-of-the-art sound quality which has been universally bestowed upon the Twin Towers. How to achieve a wider tension swing without increasing distorsion nor introducing any feedback whatsoever? The major problem was solved by adopting an intrinsically balanced input stage which drives a Double INPOL® stage in balanced configuration. By using a double triode tube - which is formed by two single triodes intrinsically identical to each other. since of course they were made with the same material, at the same temperature, in the same environmental condition and at the same time - we can achieve transfer curves which are almost identical to each other. These two triodes are driven in opposite phase as to neutralise the curve distortion. This regards tension amplification. As for current amplification. the same situation was obtained with a Double INPOL® circuit using selected NPN components. Actually, the approach to this design was not an easy commitment: the risk seemed to be of getting a powerful amplifier without the refinement and musicality typical of the T.T.. But the results were superb! The InPower reproduces sound which is exquisitely 'tube" in terms of musicality, warmth and transparency, with the speed and dynamics typical of the most respected solid stale amplifiers. As is custom with Pathos, all components are care fully selected, the signal wiring is in Pathos pure silver cable, materials and craftsmanship are of the highest level and finally the industrial design is equal to the sonic performance. In essence, the InPower introduces to the world a truly unique weaving of power and passion.